In our February-May 2016 issue of SAM Magazine, our member-only publication, we featured an article about the Silk Road Caves in Dunhuang, China as a preview of our upcoming exhibition Journey to Dunhuang: Buddhist Art of the Silk Road Caves. Our space was limited in print, so we’re featuring the whole article here on the SAM Blog. In 1943, James and Lucy Lo were newlyweds. Budding adventurers that they were, the couple set out to Dunhuang, China, by donkey cart for their honeymoon. In the remote town, there was no electricity or running water. A friend of theirs in India managed to find several thousand rolls of film for James to take with him for the trip to the area’s sacred cave-grottoes. The nearly 500 caves are collectively called the Mogao Caves—now a UNESCO World Heritage site—and are carved into cliffs about 15 miles from the oasis town of Dunhuang on the edge of the Gobi Desert. At the start of the 20th century, European explorers discovered the caves, finding a treasure trove of sculptures, manuscripts, painted scrolls, and wall paintings inside. The cave temples range in date from about the 4th to the 14th centuries, and 2,000 Buddhist sculptures, 45,000 square meters of murals, and more than 60,000 texts are preserved today. Some caves were built and rebuilt over the millennium by the devout and they continue to be an astonishing experience for visitors. The couple spent their time in Dunhuang documenting the interiors: brilliantly colored paintings that covered cave walls, ceilings, and floors, and the finely rendered stucco sculptures, some of which were of immense, towering Buddhas. The site reveals shifting artistic influences and ritual practices, attesting to a long and varied history of political, religious, and private patronage as well as local, court, and foreign military protection. That Dunhuang was a multicultural center is also attested to by surviving printed texts and hand-written manuscripts with calligraphy in the Chinese, Tibetan, Sanskrit, Uighur, and Tangut languages Visitors from the West couldn’t get to China without going through Dunhuang, as it is located at the crossroads of the northern and southern routes of the ancient Silk Road. The Los photographed the caves for 18 months, producing an unparalleled set of black-and-white negatives, remarkable for their documentary value as well as their artistic quality. They were not the first photographers to arrive at the Mogao Caves, but they were the first to document the caves with artistic intention. Indeed, the Los established iconic ways to view Dunhuang. While at Dunhuang, the Los also collected manuscript fragments, including texts and pictures. This group is the largest collection in the U.S. and reflects their broad interests in unusual scripts and in a variety of painting techniques. Also while at Dunhuang, the Los met with famed Chinese painter (and infamous forger) Zhang Daqian (1899–1983), who was there repairing and making replicas of Mogao murals. After moving to Taiwan in the 1950s, the Los became part of a community of artists and intellectuals. They invited a group of young artists to produce life-size copies of the Lo’s photographs. Some were done freehand, while others were tracings made by projecting the Lo slides on the wall. The artists then added color to the renderings by relying on the Lo’s comprehensive notes and their memories of the caves. These facsimiles are unique in their fidelity to the originals since they are collaborative and imaginative recreations. James and Lucy Lo’s photographic archive, manuscript collection, and artist renderings belong to Princeton University’s Art Museum, P.Y. and Kinmay W. Tang Center for East Asian Art, and the East Asian Library. Their current exhibition, Sacred Caves of the Silk Road: Ways of Knowing and Recreating Dunhuang, formed the basis of scholarship for the exhibition, Journey to Dunhuang: Buddhist Art of the Silk Road Caves, coming to the Asian Art Museum in March. Together, with SAM’s Director Emerita Mimi Gates’ exhibition at The Getty Museum, Cave Temples of Dunhuang: Buddhist Art on China’s Silk Road, we are bringing Dunhuang to the West Coast in 2016. An installation of Buddhist art will also be on view during the Dunhuang exhibition. The focus will be on the Buddha as depicted in Asian art, with both sculpted and painted works drawn from SAM’s own collection. The exhibition will be a geographically broad survey, and will represent works from various parts of Asia where Buddhism spread, including East Asia, Tibet, Nepal, and Southeast Asia. 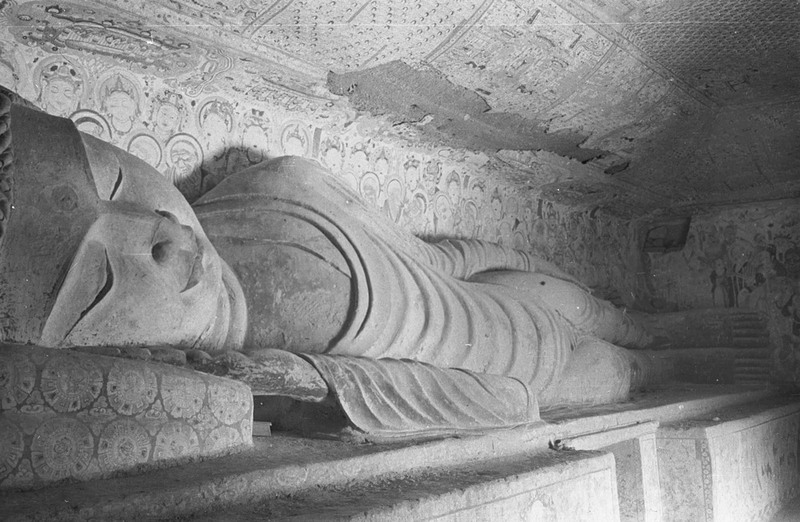 IMAGES: Parinirvana, Mogao Cave 158, Middle Tang dynasty (781–848), Photograph taken in 1943–44, The Lo Archive. 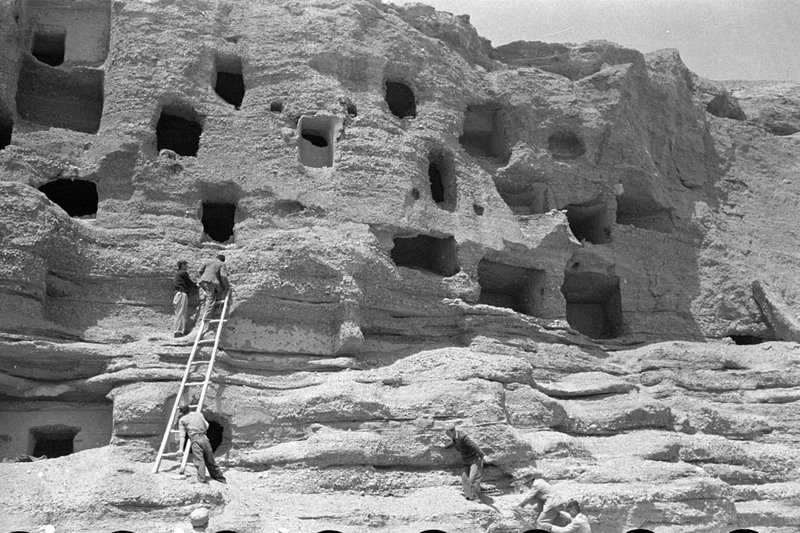 View of the Northern Mogao Cave, Photograph taken in 1943–44, The Lo Archive.